The ongoing controversy over the Iraqi Jewish Archives (discussed in other contexts here, here, here, and here) -- which were found in Iraqi intelligence headquarters in Baghdad in 2003, brought to the United States for preservation, and are currently on display at the National Archives -- appears fairly straightforward: should they or should they not be returned to Iraq? The U.S. government is planning to return the archives to Iraq next year, but there is significant opposition. An online petition and letters from Sen. Schumer and other members of Congress to Secretary of State John Kerry demand that the United States not return them. Separately, Iraq has indicated it may be willing to negotiate to allow them to stay longer -- but still temporarily -- in the United States. This post (the first of several on the debate) explores another potential forum for the controversy: a U.S. court. Could a lawsuit prevent the return of the archives and/or challenge Iraqi government assertions of ownership? The short answer is that the chances of formally blocking the return of the archives to Iraq by court order are slim, but there is a navigable path to persuading a U.S. court to adjudicate legal ownership over the archives. While litigation is often a poor method of dispute resolution, the Iraqi Jewish archives may present a scenario in which a court's careful balancing of the property rights of individuals with the sovereign rights of Iraq and a fact-intensive examination of the history, the law, and the documents could be uniquely valuable. (4) A June 2011 Interagency Agreement between the State Department and NARA relating to the completion of the preservation of the archives and their transfer back to Iraq. These newly-released documents provide details not previously known and allow analysis of some of the legal issues at a greater level of specificity. Turning to possible litigation, the first threshold issue is, of course . . .
Who could file a lawsuit over the Iraqi Jewish Archives? Locating plaintiffs who have standing to present a claim of ownership to some portion of the archives is a first challenge. Ideally, this would be individuals directly divested of ownership. Moving one step further would be descendants of such individuals. A step further than that would be organizations that could plausibly claim to act on behalf of the former Iraqi Jewish community. One website is inviting individuals to identify themselves to "claim" their "Iraqi heritage" and the NARA exhibit and digital collection may assist in identifying potential plaintiffs (as this WashPo article illustrated). Assuming proper plaintiffs can be found, there are significant obstacles to a suit ever reaching the final issue of ownership, such as the Immunity from Seizure Act, the Foreign Sovereign Immunities Act, and the Act of State doctrine. (2) that these materials were "imported pursuant to an agreement with the foreign owner or custodian" and (3) that their eventual exhibition at NARA "is in the national interest." What does this mean? Under the Immunity from Seizure Act, the publication of these determinations means that no U.S. court "may issue or enforce any judicial process, or enter any judgment, decree, or order" that deprives the institution exhibiting the property -- in this case NARA -- of custody and control of the property. On first blush, that seems quite broad, and if a lawsuit were filed in relation to the Jewish archives, the DOJ would unquestionably intervene and challenge the suit on this basis. A plaintiff could, in turn, directly challenge the State Department's determinations and the invocation of the Act. It is hard to believe that the due diligence State purports to require for requests for immunity was undertaken in the case of the Jewish archives. This checklist requires a "professional inquiry" using "independent, multi-source research" into the provenance of the property and a certification that the applicant does not know "or have reason to know" of any "potential for competing claims of ownership." Was there really such a certification regarding the Jewish archives? Moreover, the CPA/NARA Agreement may support an argument that the planned "exhibition" was a pretext to invoke the Act and that the presence of the archives in the U.S. for more than a decade without any such exhibition stretches the Act too far. The best time for such a challenge, however, would have been years ago when no exhibition was imminent. In any event, a challenge to the State Department determinations would be unlikely to prevail. See, e.g., Magness v. Russian Federation, 84 F. Supp. 2d 1357 (S.D. Ala. 2000) (refusing to overrule immunity from seizure determination and to prevent the return of cultural artifacts to Russia). While the Immunity from Seizure Act may likely therefore preclude a lawsuit against NARA challenging NARA's custody or NARA's plan to return the documents to Iraq, the Act may still allow a U.S. court to hear a case against the foreign "owner" -- the Republic of Iraq, the Iraqi Ministry of Culture, and/or the Iraqi SBAH -- in relation to the legal status of that property. See, e.g., Malewicz v. City of Amsterdam, 362 F. Supp. 2d 298, 312 (D.D.C. 2005) ("Immunity from seizure is not immunity from a suit for a declaration of rights"). As in the Chabad v. Russian Federation case regarding Jewish archives in Moscow (previously discussed here and here), a lawsuit related to the legal issue of ownership doesn't even necessarily require that the property be in the United States. A suit against a foreign sovereign government, however, raises other issues . . . Does the Foreign Sovereign Immunity Act preclude litigation against Iraq? The Foreign Sovereign Immunity Act (generally at 28 U.S.C. §§ 1602-1611) provides immunity for foreign governments in U.S. courts unless certain exceptions to that immunity apply. The Act was designed as a shield, but the exceptions have also become swords for plaintiffs. Here, the most promising is the "takings" or "expropriation" exception (§ 1605(a)(3)) which might permit a lawsuit against Iraq or Iraqi government cultural entities, if a plaintiff shows (1) that the Jewish archives were taken in violation of international law AND (2) that the Iraqi government defendant has engaged in commercial activity in the United States. For purposes of the sovereign immunity analysis, a plaintiff need not prove with finality that the archives were taken in violation of international law -- that will come if, and when, the case reaches the merits. Instead, the plaintiff must present "substantial and non-frivolous" allegations that a taking in violation of international law is legitimately in issue in order for the court to exercise jurisdiction against a foreign government. Chabad v. Russian Federation, 528 F.3d 934, 941-42 (D.C. Cir. 2008). The discovery of the Jewish archives in Saddam's intelligence headquarters is consistent with the confiscation of the property from the Jewish community during Iraq's history. A possible problem is that, to the extent the Iraqi government seized the archives, pursuant to Iraqi law, from individuals who were at the time Iraqi citizens, some courts would refuse to recognize that as a violation of international law. See, e.g., De Sanchez v. Banco Central de Nicaragua, 770 F.2d 1385, 1396 (5th Cir. 1985) ("As long as a nation injures only its own nationals" the injury "is a purely domestic affair" and is "outside the ambit of international law"); Dreyfus v. Von Finck, 534 F.2d 24 (2d Cir. 1976) (denying claim by German citizen for restitution of property confiscated by Nazis, stating "violations of international law do not occur when the aggrieved parties are nationals of the acting state"). Other courts, in contrast, have held that foreign government confiscations of property of their own citizens could be violations of international law if the taking was discriminatory and without payment of just compensation. See, e.g., Cassirer v. Kingdom of Spain, 616 F.3d 1019, 1027 (9th Cir. 2010) (finding painting seized by Nazi Germany from individual in Germany to be a violation of international law). Moreover, there may be a factual, historical argument that the relevant "taking" occurred when the owners of the property were no longer citizens of Iraq. According to Sen. Schumer's letter, for example, items within the archives were placed in a Baghdad synagogue during the mass exodus of the Iraqi Jewish community in the "early 1950s" and were only much later "seized by Saddam Hussein in 1984" when the original owners would have long since resettled in other countries. To the extent this is accurate, it could arguably internationalize the taking and provide support that such confiscations could violate international law even assuming a restrictive interpretation of the "ambit of international law." Cf. Chabad v. Russian Federation, 528 F.3d 934, 943-44 (D.C. Cir. 2008) (discussing whether at time of taking plaintiff was, or was not, a Soviet citizen). Given all of this, the right plaintiff may be able to satisfy this element. On the second . . . Under the Foreign Sovereign Immunities Act, the required "commercial activity" could come in two forms. Assuming the case is filed while the archives are still in the United States, the plaintiff could demonstrate that the Iraqi defendant engaged in a commercial activity in connection with the archives being in the United States or that the Iraqi government, as "owner," more generally engages in commercial activity in the United States. Excluded from this expansive definition of "commercial activity," therefore, is a rather limited class of sovereign acts that are uniquely governmental in character such as legislative acts or diplomatic or military activities. So has Iraq engaged in commercial activity in connection with the NARA exhibit? For purposes of the "commercial activity" analysis, Iraq authorizing the temporary removal of the archives from its territory pursuant to its antiquities law is arguably precisely the type of act only a sovereign government, and not a private party, can perform and therefore is not "commercial activity." The SBAH letter does not mention, or evidence any Iraqi involvement in, the exhibition of the archives. The exhibition plan is instead in the CPA-NARA agreement, which raises another issue: could the actions of the CPA, with legal authority over Iraq during a belligerent occupation, be imputed to Iraq? That is, could the CPA's involvement in the transfer of the archives to the U.S. for exhibition be "commercial activity" that could be attributed to Iraq? In relation to the CPA's direct actions, that may be a stretch (although worth further research). The CPA's June 2004 appointment of the Iraqi Ministry of Culture as its designee, however, to control the execution of the CPA-NARA agreement thereafter could be a more direct connection between Iraq and potential "commercial activity" related to the exhibition. Indeed, even moving beyond the underlying documentation, NARA's Iraqi Jewish Archive website currently identifies Iraq as a "partner" providing "continued support and advice." Finally, beyond its specific connections to the Jewish archives, a plaintiff could investigate more broadly other activities of the relevant Iraqi government defendants in the U.S. that may constitute "commercial activity." Has the Iraqi Ministry of Culture and/or SBAH, for example, engaged in any commercial activity in the U.S. in connection with various partnerships with U.S. entities (see, e.g., here and here), other previous cultural exhibition agreements, or even in relation to its involvement with the Ba'ath Party documents at the Hoover Institution? An additional possible obstacle is the Act of State doctrine, pursuant to which traditionally U.S. courts will not "examine the validity of a taking of property within its own territory by a foreign sovereign government" even if the taking may have violated international law. Banco Nacional de Cuba v. Sabbatino, 376 U.S. 398, 428 (1964). The doctrine raises a similar problem to that discussed above in relation to whether the seizure of the Jewish archives in Iraq from Iraqi citizens would violate international law. The same factual question may similarly determine how the Act of State doctrine might apply -- when exactly was the "taking" of the archives? For this doctrine the primary question may become whether the confiscations occurred before or after 1959. This is because Congress has limited the application of the Act of State doctrine for confiscations of property in violation of international law after January 1, 1959 via the so-called Second Hickenlooper amendment at 22 U.S.C. § 2370(e)(2). That is, if the confiscations occurred after 1959, the doctrine would not preclude the court from looking into the issue of whether the seizures violated international law. Do we ever get to the actual issue of ownership? The central frustration of litigation over the Jewish archives would be the significant period of time that could elapse before all these preliminary questions of jurisdiction and immunity (and others) -- any of which could result in dismissal of the case -- are finally determined before a court will consider the substantive issue of ownership. While I will save full consideration of that ultimate question to another day, a couple of final thoughts. First, given the long delay before reaching the merits, the possible effect of the lawsuit on the return of the archives becomes unpredictable, but fascinating. While the Immunity from Seizure Act, as discussed above, may preclude an effort to prevent the return of the archives by court order, an active lawsuit calling into question the ownership of the archives might nevertheless alter the U.S. government's calculations regarding their return to Iraq. Moreover, while litigation could create a corresponding incentive for Iraq to demand a prompt or even expedited return of the archives, the return itself would have the effect of lifting the protection of the Immunity from Seizure Act, thereby empowering a court, depending upon its ultimate determinations regarding ownership, to order a transfer of custody to a prevailing plaintiff. While the chance of Iraq complying with such a court order would unquestionably decrease if the archives had already returned to Iraq, a refusal could result in the same kind of contempt sanctions being imposed on the Russian Federation on a daily basis in the Chabad case. Second, in relation to the merits, I will say that the growing digital collection of the material increasingly appears to undermine an implicit assumption of the broader debate that the "Iraqi Jewish Archive" should be treated as one whole. The scope of the material varies widely (which is not surprising given their haphazard discovery in a flooded basement). 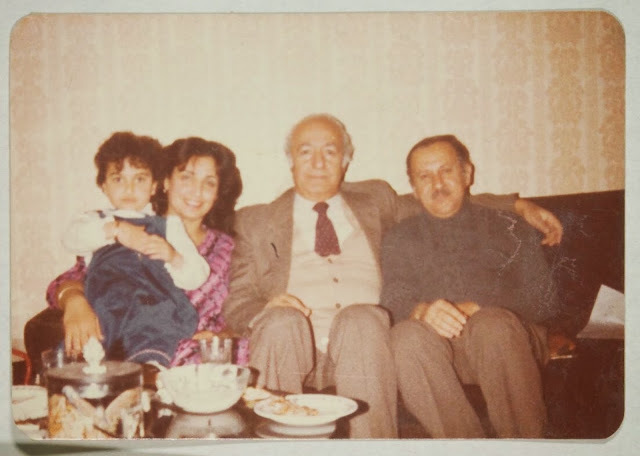 On one extreme, there are documents and photographs of a personal nature that defy classification as Iraqi government records or Iraqi cultural property . . .
On the other extreme, there are Iraqi ministry records relating to Iran, Iraqi intelligence records about Israel, and others that rather clearly appear to be Iraqi government records . . . Put another way, the "Iraqi Jewish Archive" is not always "Iraqi," not always "Jewish," and it is not a unified, cohesive "Archive." This argues for a careful, fact-intensive examination of the materials in assessing their proper status whether in public debates over the controversy, in formal diplomatic negotiations, or, as a last resort, in court.